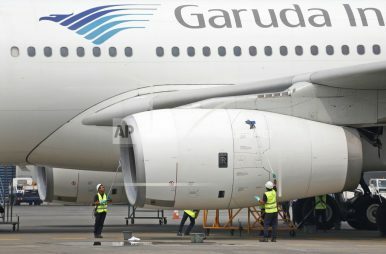 In this Sept. 28, 2015, file photo, workers clean a jetliner at GMF AeroAsia facility at Soekarno-Hatta International Airport in Jakarta, Indonesia. The announced cancellation follows two incidents in the past six months, including a crash in Indonesia. In a blow for Boeing, Indonesia’s flag carrier is seeking the cancellation of a multibillion-dollar order for 49 of the manufacturer’s 737 Max 8 jets, citing a loss of confidence after two crashes in the past six months. By Niniek Karmini for The Associated Press. Bilateral ties continue to face some familiar challenges.